The Shovel Knight, defeated by fate, has spent many years gardening in obscurity. During his absence the world has fallen into chaos. The land is rife with villains that need spaying and you’ve got just the tool for the job. So take up your shovel, knight, and scoop yourself out a steaming pile of justice. 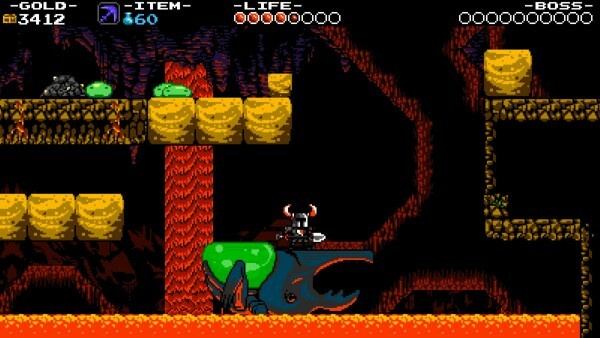 Let’s start with this statement: Shovel Knight is awesome. Just a blanket statement; over the whole game. It’s an interactive testament to how a simple game can be packed with wonderment. Every single aspect of the game contributes to this purpose and they do so magnificently. Without a doubt this is one of the best side-scrolling games ever made. So before I spin into a whirlpool of hyperbole, let me break down why this game is so great. Starting with the art. Several years ago, when indie games were first gaining a solid place in the market, we saw a resurgence of pixel based art. 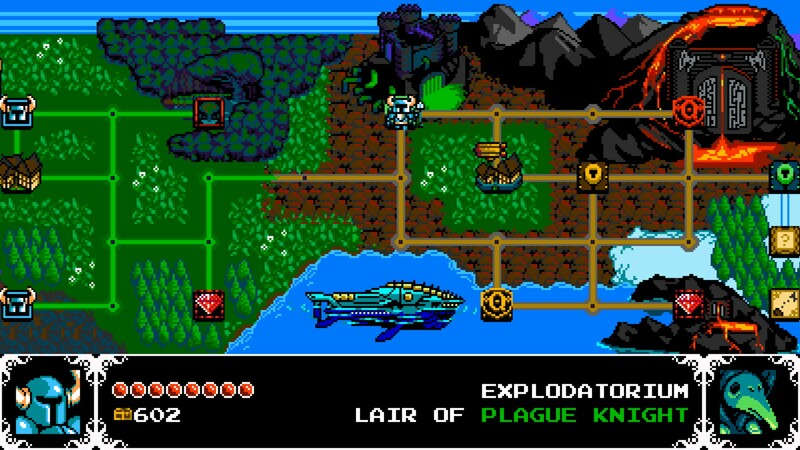 This kind of style has rapidly approached the tipping point of rote and so it would be easy to overlook Shovel Knight for this reason. The one thing that Shovel Knight has above the sea of pixels is its cheer. Every character and environment is brought to life with an aloofness that is delightful to watch. Characters don’t move with artful fluidity, rather they don goofy smiles and gallivant about the screen in a staccato manner that is joyous. There is a scene where someone dances around the screen while onlookers clap in chorus. It had me grinning from ear to ear in a way games haven’t made me grin in ages. That scene would not have been half and mirthful if not for the music accompanying it though. 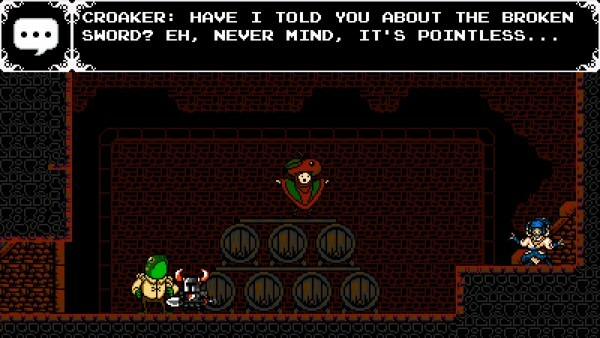 Shovel Knight‘s soundtrack excels at massaging your nostalgia center in all the right ways. The soundtrack by Jake Kaufman (Retro City Rampage) and Manami Matsumae (Mega Man) ranges from a driving epic to somber tranquility, all while respecting its 8-bit roots. If you’re a fan of the beats of Megaman or, more recently, Scott Pilgrim Vs. The World: The Game, you will find nothing but delight here. The soundtrack, while great in the game, could stand on its own. The soundtrack will be available here by the way. Plenty of games have enjoyable art and 8-bit jams and still stink; Shovel Knight is not one of those games. It bubbles forth the difficulty of the NES era without actually being as hard. The game is challenging, to be sure, but it benefits from modern conceits like exacting controls and, dare I say, checkpoints. When you die, it’s not the game killing you, it’s your own inability to deal that’s killing you. Through if you feel your ability to deal is better than most you can always smash the checkpoints for a little extra gold. Though Shovel Knight is very competent with his spade slicer, there are also special relics to be found. These relics increase your combat abilities and open up new areas for exploration. A relic I found particularly useful let me become invulnerable for a brief time. This obviously aided in combat but would also allow me to walk on spikes, something that normally resulted in instant death. Now my spike-proof knight could reach new areas and, subsequently, new treasures. After you’ve bested the levels, a feat in and of itself, you get the privilege of fighting the many bosses in the game. These bosses do their old-school job by testing your mettle and forcing you to use your abilities in different ways. For example, one boss removes bits of the floor, revealing spikes. So during this fight I not only had to attack the boss relentlessly but I also had to manage my magic in a way that allowed me continue to use the aforementioned invulnerability relic. It was an intense fight that, like most, I cleared with only one health left. The game also has wandering bosses that bar your path in the map. These do not make you dig your way through a level to fight them, they simply appear and you battle. It’s a nice break the grind of completing each level consecutively as they are just a one-on-one standoff immediately. There are also wandering enemies that do exactly the opposite, give you a level without a boss. These levels are usually full of treasure with forced scrolling. These side adventures and bosses are like a cherry on the top of Shovel Knight‘s ice cream, frivolous overall but so detectible. So, Shovel Knight is awesome, we’ve cemented that. It is as fun to watch as it is to listen to. It gives you precise control over your own defeat or triumph. It even has a frog that tells you puns. A frog that tells you puns. 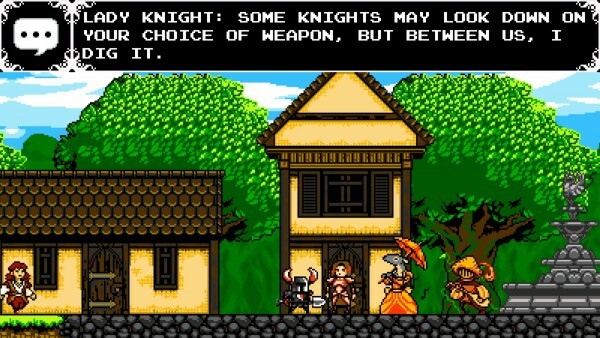 I could not be happier with Shovel Knight as it is exactly my kind of game. It is unconcerned with modern videogame frivolities yet accepts the improvements that modern games can bring. Some may find it too hard, others may find it too plain, but I think it’s just right. [button color=”blue” link=””]Must Play[/button] Must Play: A game that receives a “Must Play” rating may not necessarily be perfection – no game truly is – but it is something that the editor believes must be played by you. They will not hesitate to tell you to right that instant. Keyboard Vs. Controller – Just use a controller. You want the most control you can get and the keyboard just does not provide that fidelity.